Thus, Galveston is the home of Juneteenth, the holiday that sprang from that June 19th announcement. 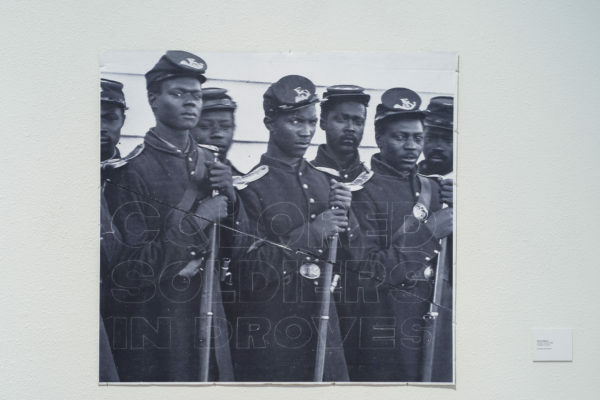 And that’s the reason for the title of the Galveston Arts Center show, Two & ½ Years: A Visual Celebration to the Spirit of Juneteenth, a collaborative project by artists Tierney Malone and Robert Hodge. The Galveston Arts Center is presenting the visual component of the 2 ½ Years project. 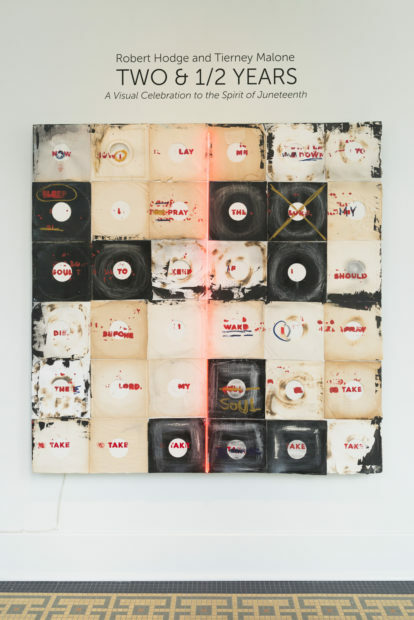 Malone and Hodge are generationally different artists, but both use imagery from popular culture. 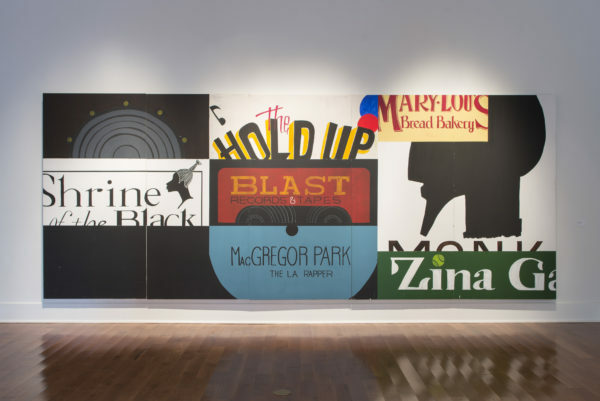 Malone riffs on history and jazz with cool, elegant paintings carrying fragments of text and cropped graphic images culled from album covers, books, and signs. 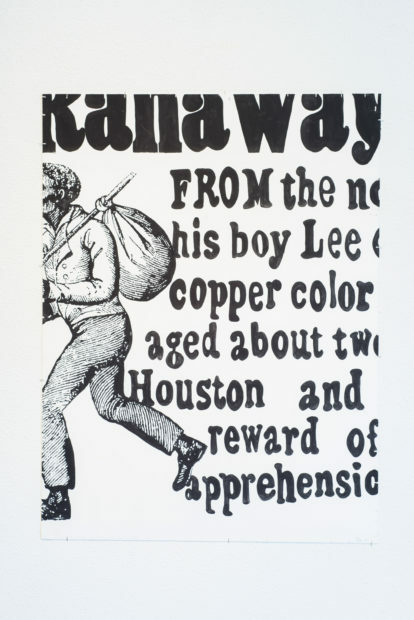 He uses bold areas of color and spare and dramatic forms with his artfully selective text. 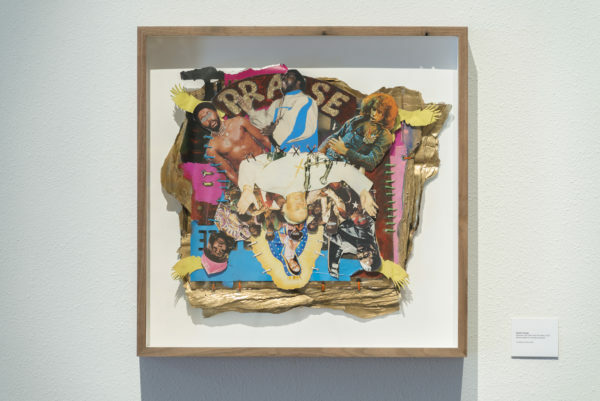 Hodge has a much more raw aesthetic as he creates collages of frenetically layered figures from culture—pop and otherwise—running the gamut from MC Hammer to Pope John Paul II. 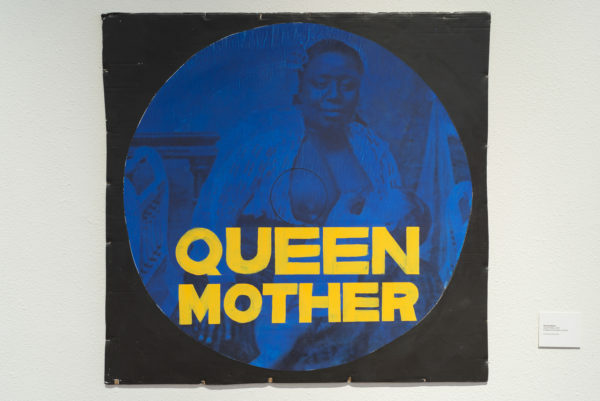 He visually samples iconic African-American artists like Aretha Franklin and white artists like Elvis who ripped off African-American culture. He arranges them in politically and culturally charged combinations. Hodge builds up jagged layers of painted and sometimes “gilded” cardboard scraps to create a substrate for these collaged images. Their irregular shape and thickness make them almost sculptural; they look like giant chunks of bark pried off some mammoth East Texas pine.